I recently surfed into an unexpected but interesting and very useful Japanese learning resource on the BBC website called A Touch of Japanese. Don’t expect a zillion pages of learning material, but the few pages and examples (with audio) there are very useful for a basic Japanese lesson that can be completed in one sitting. Of course I was beaming from ear to ear because I understood the dozen or so Japanese words and phrases on the site which is mainly focused on introductions, useful phrases, good manners and facts about Japan. 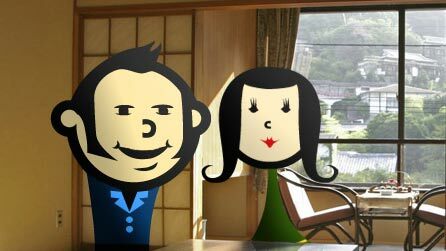 There is a great interactive Japanese challenge on the site that puts you in the shoes of a traveler to Japan and asks you to imagine you arrive at the airport, equipped with a print-out of your Internet booking for your stay at a ryokan and have to use a few few Japanese phrases to interact with people as you try to find your way to the inn. You are really good at finding these innovative learning aids! If only University was like that! Not a bad little reference site! Good find. Good stuff! Lovely that the BBC is taking an interest in Japan more and more these days!! Thanks for the resource! The BBC has some really good language learning stuff, but I wish they’d beef up their Japanese section a little more… all in good time I’m sure. I saw a great documentary on the Japanese work place last night. Seems as though the BBC has a ‘hidden Japan’ season going on, so we’re getting a lot of this sorta stuff. Check out bbc.co.uk and bbc4 for more. Wow I searched around on the BBC site and found some interesting programs, too bad I can’t watch online from my location. When I get home I’ll check to see if any of the BBC channels I get via cable will show any of these. Interesting shows more and more how popular Japan and Japanese in general is becoming these days.